This wood frame features a hand-rubbed blue green finish with ivory undertones and champagne details. Mirror has a generous 1 1/4" bevel. From Uttermost. 27" wide x 37" high x 2" deep. Hang weight is 45 lbs. Glass only section is 18" wide x 28" high. Surrounding frame is 4 1/4" wide. Beveled edge is 1 1/4" wide. 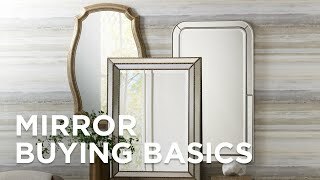 Ogden rectangular wall mirror designed by Grace Feyock for Uttermost. Hand-rubbed blue green finish. Wood frame construction. I got this mirror for a new guest bathroom. We have received many compliments on it, note that the colors are deeper than the online picture. The odgen blue mirror is not blue. It is, however, a very nice shade of green. A little disappointed, because I was going for a blue accent, but I am ok with it. Frame is gold leaf not silver leaf. Green is a mint color, kind of a linen look, but even color mint. Wish it was silver leaf as described cuz it will go over carrara marble and gray cabinets. George Pinched Outer Border Wood 30" x 40"
Decorative pinched details surround the streamlined wooden frame of this rectangular wall mirror.